If you one of those brides who want to make every single detail of their wedding special, you’re gonna love this list. We’ve found a way to make ring boxes interesting. You’ll love these cool ring displays and so will your ring bearer! Getting married means you’re ready to build your own nest. That’s one of the sweetest things you two will do together. But first, you gotta put a ring on it! When your little ring bearer is walking down the isle, make sure he’s carrying your wedding bands in something cool. 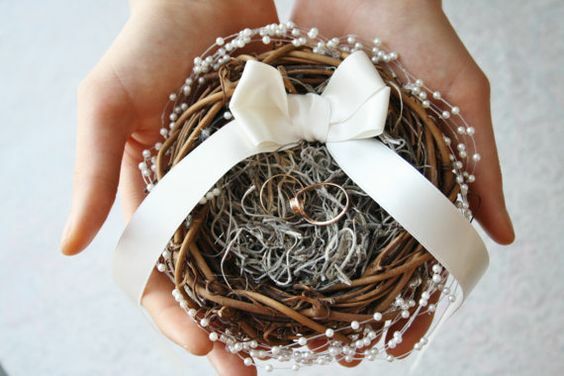 This tiny nest decorated with pearl beads and a satin bow is a wonderful substitute for a simple, old box. You wanna have every single detail of your wedding spectacular. After the whole ceremony’s done this will be a nice keepsake to put on the shelf.